A trip to Mount Baldy should include a hike along the Devil’s Backbone, a daunting ridge east of the summit with tantalizing views. 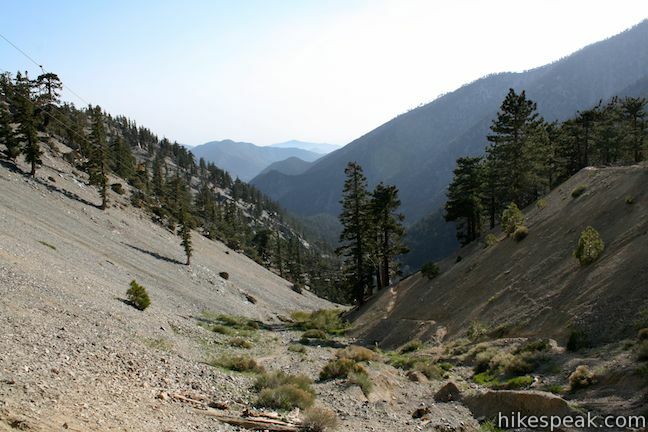 One way to reach Devil’s Backbone Trail is to first hike up to the summit of Mount Baldy on Baldy Bowl Trail and then hike down the Devil’s Backbone (as you would do on the 11.3-mile Mount Baldy Loop). To start from the bottom of Devil’s Backbone Trail, you must make your way to Baldy Notch, occupied by the Mount Baldy Ski Area. The question to answer is: Should you hike or take the ski lift? You may get to and from Baldy Notch on the Mount Baldy Ski Lift, which runs seven days a week. The cost of the lift is $25 round trip for adults, $20 for youths age 13 to 17, $15 for children under 12 (must be at least 40″ tall), and $15 for seniors over 65 (prices as of 2018). Tickets for the lift may be booked in advanced. 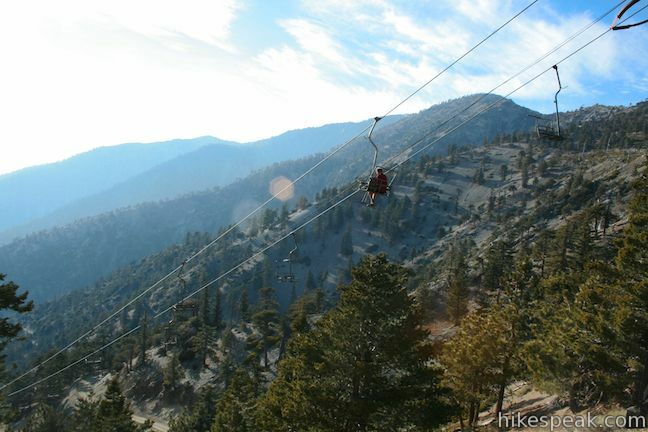 The ski lift – or mechanized mountain climber – cuts out 1,500 feet of elevation and feels a lot like cheating… However, the ski lift omits the least interesting segment of the Mount Baldy loop, so utilizing it is understandable. 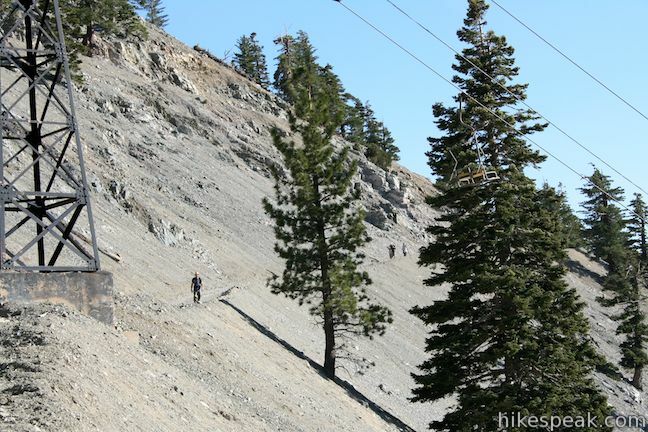 If you choose to use the ski lift, there will be a quarter mile of paved road to walk between the parking area at the base of the ski lift and the trailhead for San Antonio Falls and Baldy Bowl Trail. 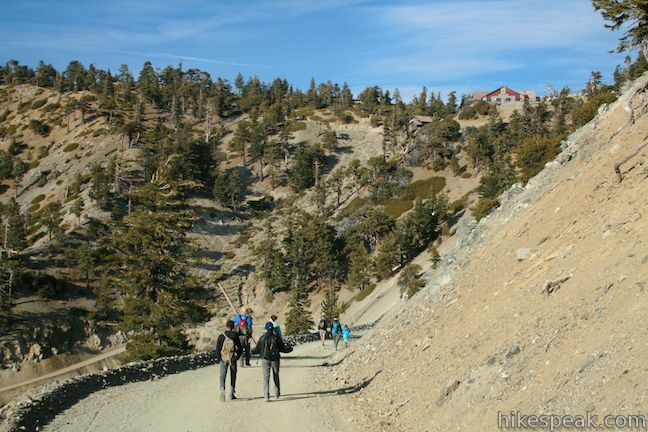 If you plan to go to the summit and back on Devil’s Backbone Trail (and not hike the loop including Baldy Bowl Trail), you should drive up to the base of the ski lift and take the connection trail that starts to the left of the lift. Follow the wide dirt trail up to the fire road and turn right. The road weaves up the west side of the canyon, passing beneath the ski lift to reach a junction 0.3 miles from Baldy Notch. Make the obvious left here to reach the lodge at the top of the ski lift. Continue beyond the lodge as the road turns left (west) up the mountain to Devil’s Backbone Trail. Starting from the ski lift parking lot, the trail to Baldy Notch is 2.3 miles in length, which is 1.2 miles shorter than starting up the trail near San Antonio Falls. For those hiking across Devil’s Backbone Trail as part of the loop with Baldy Bowl Trail, 3.5 miles of trail descend from Baldy Notch to the trailhead. Hike down the dirt road in front of the lodge at the top of the lift, following a series of long gradual switches down the mountainside. The trail passes beneath the ski lift and heads south down the west side of the canyon. 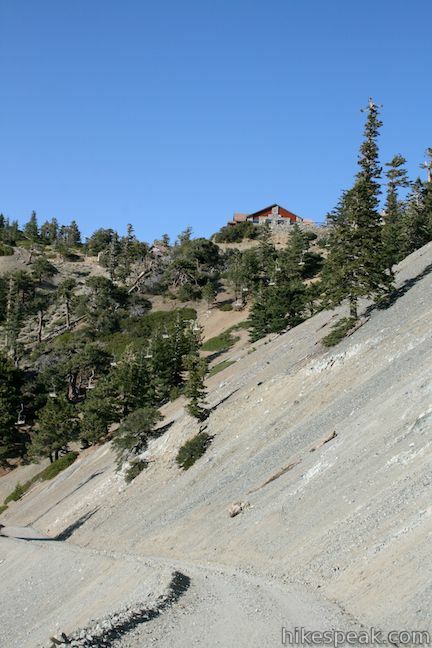 Pass the turnoff for Baldy Bowl – Ski Hut Trail and continue down to San Antonio Falls. After 10.7 miles of hiking (assuming you took Baldy Bowl Trail to the summit and descended on Devil’s Backbone Trail), the short detour down to the waterfall may be just what you need. Soak your soar feet in the cold water. It is just 0.6 miles farther down the paved Falls Road to return to the trailhead. To get to the trailhead: Take Interstate 210 east to Baseline Road (exit 52). Turn left at the light at the end of the ramp on to Baseline Road. Make the next right on to Padua Avenue. Drive 1.7 miles and turn right onto Mount Baldy Road (at a traffic light). 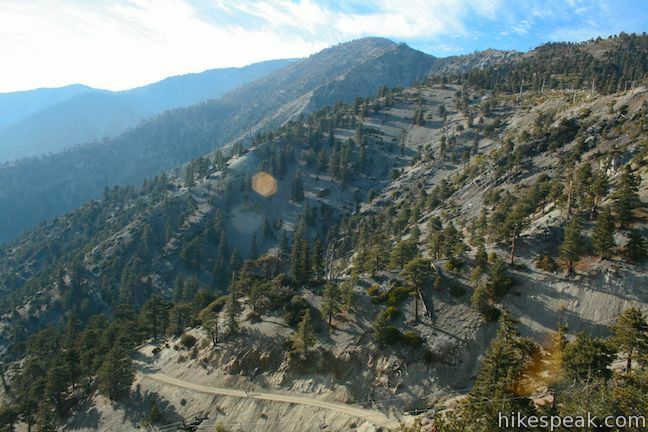 Continue 7 miles up Mount Baldy Road through Mount Baldy Village (which has a visitor center) and follow the road for another 4.4 miles up the mountain past Manker Flats Campground to the bottom of Falls Road on the left. 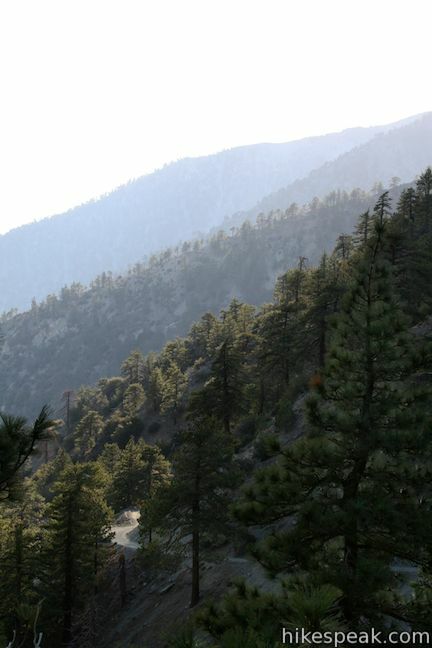 Park along Mount Baldy Road, display an adventure pass, and begin hiking up Falls Road. To take the ski lift, continue driving past the campground to the end of the road. How far is it from the chair lifts to the summit? Where would one pick up the trail to hike to the summit? How far is it from the chair lifts to the summit? 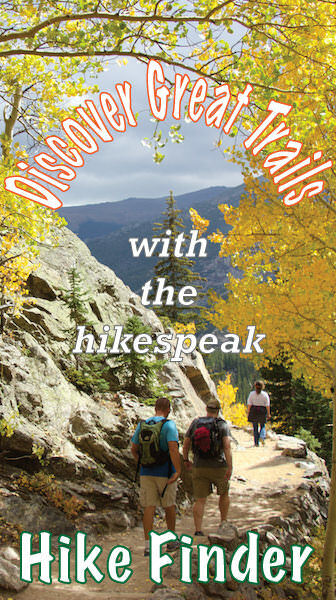 Where would one pick up the trail to hike to the summit from the chair lifts? Hey Mary, I don’t know if you ever found out your answer, but the hike to the Baldy summit from the Notch is 3.2 miles each way. You pick up the trail about 755 feet down the dirt road from the Top of the Notch Restaurant. The Devil’s Backbone service road leading the the Devil’s Backbone Trail is located across from the service road leading up to Thunder Mountain. The senior pass should work instead of an adventure pass. Have a great trip! What is the elevation at the Baldy Notch?